"Clifford William King Sadlier (1892-1964), soldier, clerk and commercial traveller, was born on 11 June 1892 at Camberwell, Melbourne, fourth child of Irish-born Thomas George Sadlier, salesman and later indent agent, and his wife Mary Ann, née Roberts, from Adelaide. After attending University High School he accompanied his family to Perth where they settled in Subiaco. 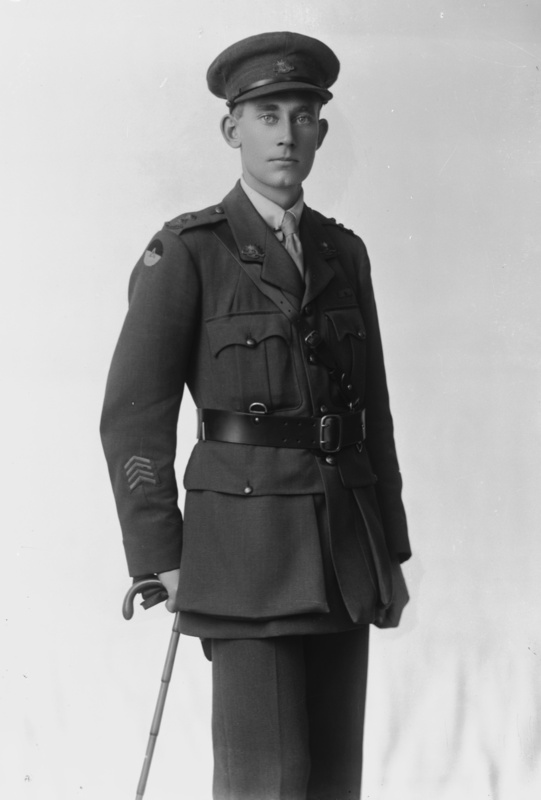 Sadlier was working as a commercial traveller when he enlisted as a private in the Australian Imperial Force in May 1915. Posted to the 1st Australian General Hospital, Australian Army Medical Corps, he embarked for Egypt in June and served with the hospital at Heliopolis. In March 1916, he returned to Australia on nursing duties but on 9 November he re-embarked for active service as an acting sergeant with the 7th Reinforcements for the 51st Battalion. In England he reverted to the rank of private on 11 January 1917 but in February began a course at the school for non-commissioned officers, Tidworth. Crossing to France, he joined the 51st Battalion, 13th Brigade, on 13 May. He was promoted corporal five days later and was commissioned second lieutenant on 14 July and promoted lieutenant on 1 April 1918. Sadlier won the Victoria Cross for what the official historian, Charles Bean, called 'an extraordinarily bold attack' on German machine-gunners during the 2nd battle of Villers-Bretonneux on 24-25 April 1918. The Germans had re-taken the town in a dawn attack on 24 April. Allied counter-attacks were carried on all day without success but towards evening hurried orders were given for another counter-attack using the 13th Brigade on the south and the 15th Brigade on the north. The 51st and 52nd Battalions were allotted for the 13th Brigade's advance and they set out at 10.10 p.m., in darkness and under enemy artillery fire. Beforehand they had been told to ignore any noise in a wood to their left as British troops were clearing out small enemy parties there. Hardly had the advance begun, however, when several machine-guns opened up on the Western Australians. Most of the company adjoining Sadlier's were killed but Sadlier led his men forward only to be halted again by machine-guns. He organized a bombing attack and having located the nearest machine-gun post, led a Lewis-gunner and a bombing party against it. Before the Germans had recovered, the Australians were in among the trees fighting wildly in the dark. Hurling bombs as they ran, they silenced one machine-gun post and although Sadlier was shot in the thigh they went on to destroy two more. Sadlier was then shot again this time, in the arm and was forced to the rear but his few remaining men continued the job and the threat to the 13th Brigade's advance was removed. Although running an hour late it got through and linked up with the 15th. By dawn Villers-Bretonneux was again in allied hands. On 24 October Sadlier was invalided to Australia and his A.I.F. appointment ended on 4 March 1919. On 23 August 1922, at St Mary's Anglican Church, Perth, he married Maude Victoria Moore. Throughout the 1920s he worked as a manufacturer's agent and in 1929 briefly ran his own indent agency. Next year he unsuccessfully contested the State seat of Nedlands as a Nationalist. His marriage ended in divorce in 1934 and on 17 July 1936 he married Alice Edith Smart at the Presbyterian manse, Subiaco. From then until 1949 he was a clerk in the Repatriation Department in Perth. Invalided out of the public service, he moved to Busselton where gardening became his chief interest. Survived by his wife, he died there, childless, on 28 April 1964 and was cremated for ten years he had suffered from emphysematic bronchitis."